The town of Barnstable has 7 villages, including Hyannis, with beaches on Cape Cod Bay to the north and on Nantucket Sound to the south. Along the town's many miles of shoreline, visitors have a wide variety of beach experiences to choose from. Parking Fees: From Memorial Day to Labor Day, during normal beach hours, a daily fee or a parking sticker may be required. (See below for "daily fee" and "sticker" beaches). No entrance fees are charged to those who walk or bike to Barnstable-Hyannis beaches. Daily parking fee ($15 weekdays, $20 weekends and holidays) may be paid to the attendant at the gate. Stickers: Weekly parking stickers ($50/week) may be purchased at Hyannis Youth & Community Center, 141 Basset Lane in Hyannis, and by mail-in application. Call (508) 790-6345 for more info. The 7-mile long stretch of spectacular coastline known as "Sandy Neck" spans all the way from Sandwich to Barnstable, on the north (Cape Cod Bay) side of the Cape. If you're looking for crystal clear water, rolling dunes, and gorgeous views, Sandy Neck Beach is the place to go! Crowd Factor: Lots of people go to Sandy Neck, but with a short walk in either direction you'll be on your own. Amenities: Lifeguards, restroom and shower facilities, and food concessions. Handicap access oversand wheelchair available. Location: Off Sandy Neck Road in West Barnstable. Parking: Large parking lot. Daily fee ($15 weekdays, $20 weekends and holidays) payable at the Gatehouse entrance. Town-issued parking stickers from Barnstable and Sandwich also accepted. 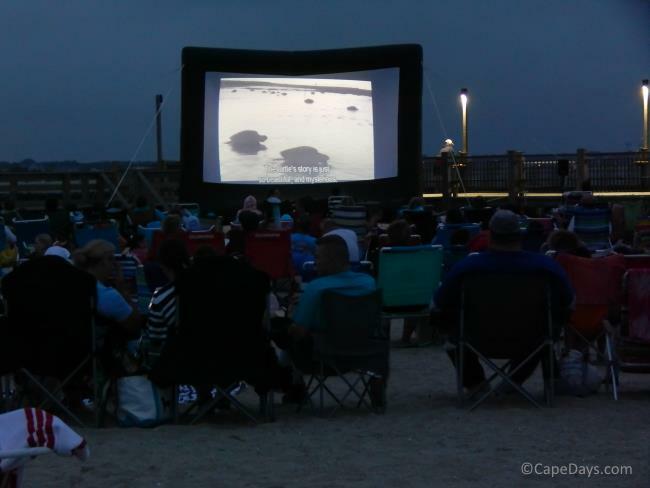 Craigville Beach is a favorite teens, college students and families. This very long, wide expanse has warm waters, gentle surf, and a large designated swim area. Crowd Factor: Moderately to very crowded, especially on summer weekends. Amenities: Lifeguards, restrooms and shower facilities, snack bars just across the street. Beach wheelchair available. Parking: Large lot. Sticker or daily fee required. 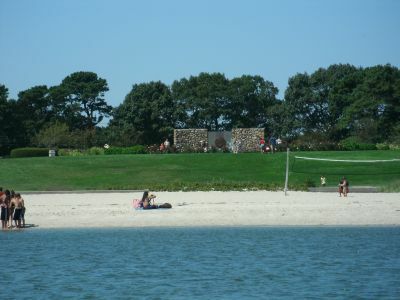 Kalmus is one of the most famous Hyannis beaches. It's known worldwide as a fantastic windsurfing venue, thanks to our prevailing spring, summer and fall breezes. Half of Kalmus is dedicated to windsurfing, kite flying and other sporty endeavors, while the other half is more sheltered for swimming, sunbathing and picnicing. Crowd Factor: Not overly crowded. Amenities: Lifeguards, restroom and shower facilities, and food concession. MobiChair available. Parking: Ample. Sticker or daily fee required. 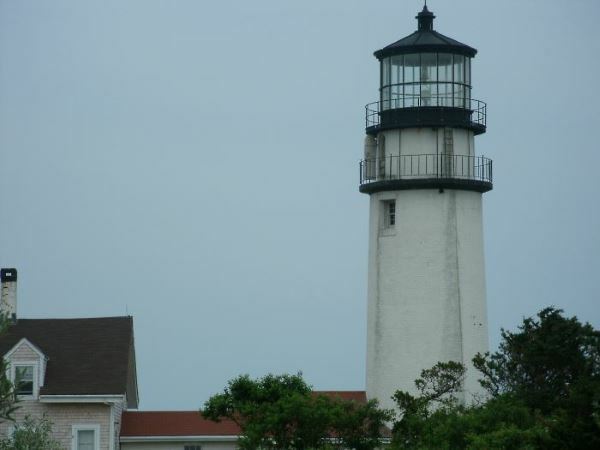 This Hyannis beach is a great place to relax, have a picnic, and watch the tour boats and pleasure yachts making their way along the Hyannis Channel. The water's calm here, and the sand is soft. It's a wonderful choice of Hyannis beaches for families. 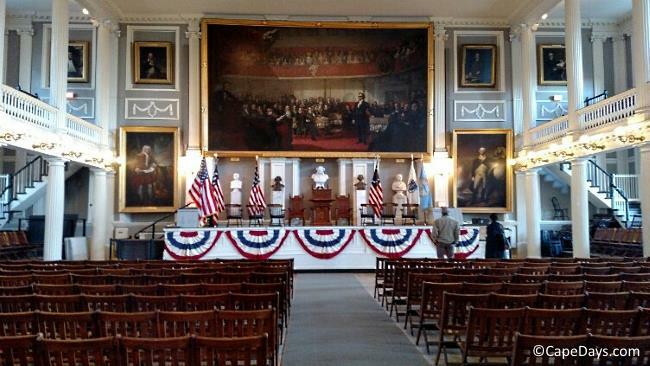 Crowd Factor: Rarely gets overly crowded. Amenities: Lifeguards, restroom and shower facilities, snack bar, stairs leading from parking lot down to beach. Parking: Ample parking. Sticker or daily fee required. Veterans Beach has one of the prettiest settings of all Hyannis beaches. It's backed by a small park with shaded areas and a large expanse of lush lawn that slopes down to the shoreline. Veterans Park features two historical monuments - one to the late President John F. Kennedy, the other to veterans of the Korean War. The beach itself is somewhat "shelly", wonderful for kids with buckets and anyone who collects seashells for jewelry or crafts projects. Amenities: Lifeguards, restroom and shower area, snack bar, and park facilities as described above. beach wheelchair available. Parking: Sufficient parking usually available. Sticker or daily fee required.